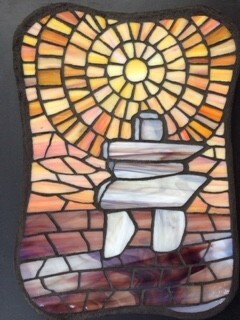 Stained glass mosaic, grouted, about 8"x11". My fascination with inukshuks and sunsets, both of which I love, continues. When I was looking at this gold coloured and moon-bright amber stained glass on my shelf, I wanted to use it right away. I imagine this inukshuk facing away from the viewer here, gazing at the moon exactly as I do.